Most of the original gang returns for this sequel except for director, Tim Miller. Creative differences arose between Miller and producer/lead actor Ryan Reynolds, who’s really calling all the shots here. Despite different directors, an inflated budget, “Deadpool 2” is more of the same, a lot more. More violence, more crude jokes and a dizzying amount of movie references. The “Deadpool” series is refreshingly different from any other superhero flick on screen today. However, it’s a bit hard to enjoy some of the creativity when the script and editing hurl a smorgasbord of elements toward the audience at high speed. Josh Brolin is having a momentous year appearing both in Infinity War and here as Cable. 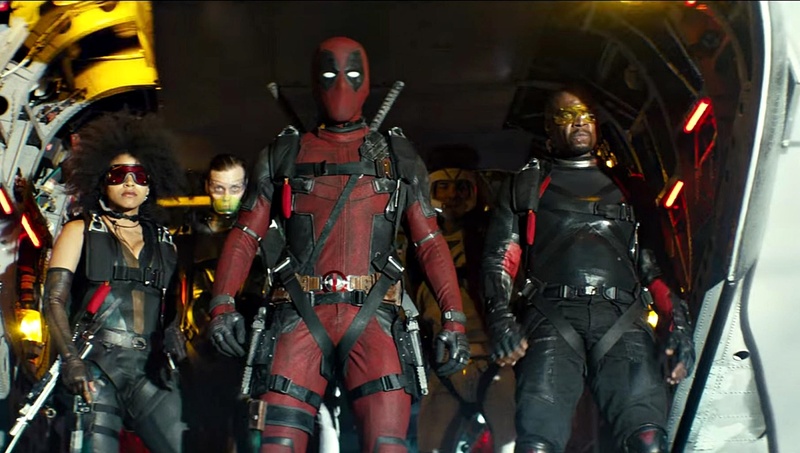 It’s unusual for one actor, playing different roles in two Marvel franchises, but the Deadpool 2 script makes fun of that too. Wade (Reynolds) is having the typical day of dealing with villains in his own special way before settling back at his apartment with girlfriend Vanessa (Baccarin) for some baby making. Everything is disrupted though when tragedy strikes after his work follows him home. At the same time, Cable (Brolin), a trime traveling mutant from the future, arrives to kill an emotionally disturbed young mutant, who will do great damage to the future. Deadpool goes to prison, is recruited by the X-Men, but ultimately decides he needs his own team which he names X-Force. Deadpool, his bartender buddy Weasel (Miller), and cab driver Dopinder (Karan Soni) audition mutants for the new team. The most promising is a lucky gal called Domino (Beetz). The fusion of costume and visual effects design of Cable might be one of the best comic-book to screen creations yet. It’s hard to dislike a film that pays tribute to Dolly Parton’s “9 to 5;” or that has Celine Dion perform the opening title sequence, a James Bond spoof. The parody element of Deadpool is refreshing: a superhero film that doesn’t take itself too seriously. Every Marvel movie, old and new, is cynically poked and prodded; with some very nice jabs at DC films as well. It’s impossible to absorb all gags and rips without watching this one more than once. There are hundreds of puns, pokes and jokes intertwined within this action narrative. The maddening pace and density of all this material can be exhausting for the viewer suffering from “superhero fatigue”. Though being familiar with the other films in the Marvel (and DC) universe is the key to unlocking much of Deadpool’s entertainment value. If you were impressed by Julian Dennison in the 2016 New Zealand indie “Hunt for the Wilderpeople”, you will be delighted to see how the young actor is used here. While the plot narrative is disorderly and changes directions every few minutes, there are some nice, albeit predictable, surprises. The fusion of costume and visual effects design of Cable might be one of the best comic-book to screen creations yet. Artist Dan Brereton’s memorable Cable paintings from the mid 90’s on trading cards are brought to life with Brolin’s manifestation of this character. “Deadpool 2”’s most memorable scenes is a “Basic Instinct’’ moment that you won’t be able to un-see after watching. All things considered though, this isn’t a film I’ll likely revisit again because in the end its creative antics amount to nothing more than mindless entertainment. An ideological fast food playground for comic book fans.